Our planet is a cool and good planet. To prove this point, I would simply point you to the map above. 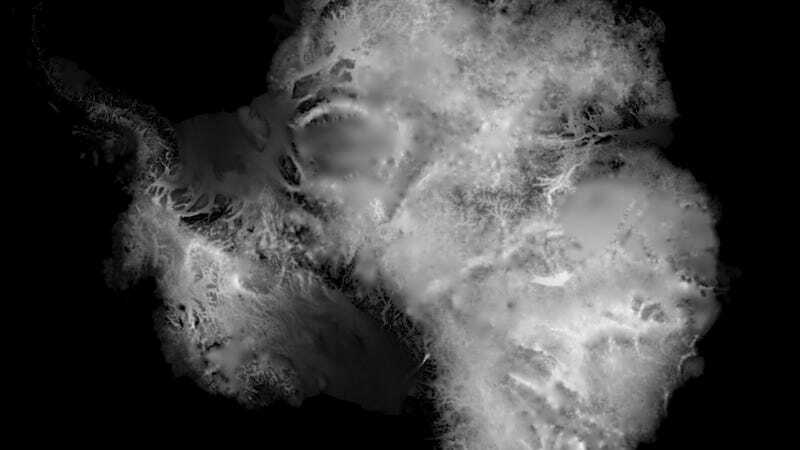 The ethereal black and white image shows the thickness of all of Antarctica’s ice. It speaks to both the grandeur of the seventh continent and human ingenuity. Why humanity is on a course to melt all that ice is beyond me. The map comes courtesy of Kevin Pluck, a software engineer, statistician, and animator, who pulled a massive dataset of Antarctic ice known as Bedmap2 for a project he was working on (more on that in a moment). The dataset is the compilation of a number of different observing methods, including airborne radar and satellite measurements. It took scientists years to compile and is one of the most comprehensive datasets of Antarctica’s ice and underlying bedrock. The white areas are where the ice is thickest, with the towering and stable ice sheet of East Antarctica standing out most prominently. The Antarctic Peninsula—home to the Larsen C ice shelf that calved a huge iceberg last year—drifts off in the ocean in the upper left corner, but it’s that ghostly patch of gray and black in the lower left that had Pluck downloading the data in the first place. The glaciers that hold back West Antarctica are the weakest links in the icy armor ringing the continent. They could already be in a state of unstoppable collapse that will unfold over centuries, causing seas to rise by up to 10 feet. But some scientists are growing concerned that changes could happen even more rapidly due to something called marine ice cliff instability, where a quirk of geology could create enormous problems. The bedrock slopes downward under some of West Antarctica’s glaciers the further inland it goes. That means as warm waters eat away at the front of glaciers, the ice cliffs that remain grow ever higher and more prone to collapse under their own weight. Thwaites is one of those glaciers where this process could play out. In an effort to suss out what’s happening there, the British Antarctic Survey and the National Snow and Ice Data Center announced a new collaboration on Monday. The $25-million investment will fund eight projects aimed at getting a better handle on how the glacier has changed in the past and what the future may hold. Pluck and Marlo Garnsworthy, his partner at the science communication firm Pixel Movers and Makers, were working on graphics for the announcement when he made his inadvertent Antarctic artwork. I’m not sure the Antarctic ice image qualifies as funny or hopeful, but it sure is appealing.